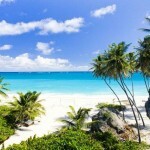 Cheap flights from UK to Caribbean - Barbados from £280! Planning to visit Caribbean still this winter season then consider our solution to visit beautiful Barbados. This option is based on charter provider Thomas Cook Airlines. Just for a few limited travel dates you can book cheap flights from UK (Manchester) to amazing Caribbean isle Barbados currently available already for £280 (€313). This is including checked bag up to 20kg. If you were looking for some cheap exotic holidays this is great opportunity.. These round trip flights from Manchester to Barbados (Bridgetown) have very limited availability in December 2017. At this moment only few travel options at the lowest fare are available. We are adding booking sample of such a flight between UK and Barbados below. However for additional £ you can book your flight throughout whole main tourist season 2017. Thomas Cook Airlines offer monthly view so you can easily find the lowest fare available. Check here if you would need to do so..
To book these cheap air tickets you have have to look for departures ex Manchester to Bridgetown. Above mentioned price for round trip flight includes all taxes and fees, hand-luggage up to 6kg as well as checked luggage up to 20kg are included. Barbados is offering full service and wide range of accommodation. This offer is great solution for people looking for luxurious holidays in Caribbean.. Barbados definitely does not belong to the cheaper destinations in Caribbean Sea..You can make basic idea what are the hotel rooms prices like through Booking.com or Hotels.com. Booking sample of a flight from UK (Manchester) to Barbados in Caribbean for just £280 below. In this case you would be departing from Manchester to Barbados on 10th of December. Your return flight from Caribbean back to Europe would be on 24th of December 2017. Want to escape to Caribbean in main season this is great solution..